Well, I couldn't take it any more. At six o'clock this morning, I walked to Fondren and Moonmist and cleaned up the Fondren left turn lane. I'm jealous of those neighborhoods that have beautiful medians and clean streets. We don't have either. So, this morning I tried to help change that. 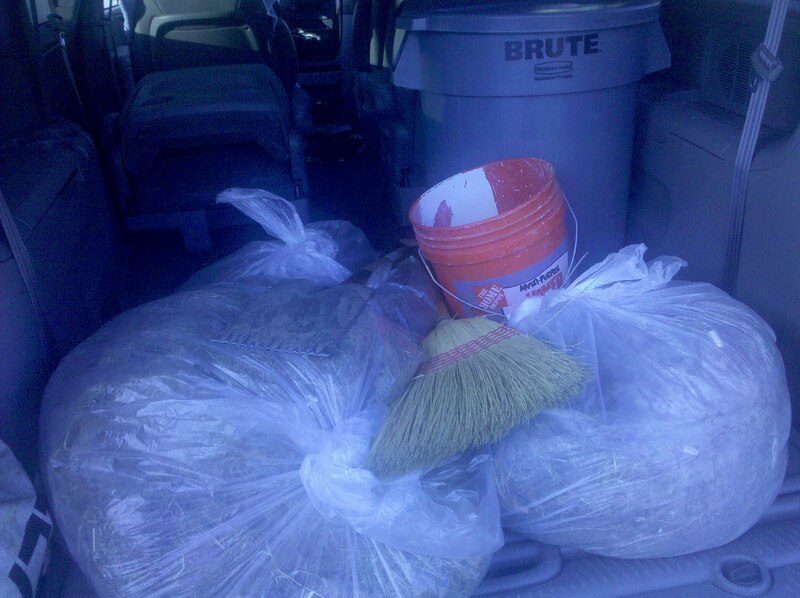 I took a broom, shovel, and a five gallon pail to cleanup the trash that accumulates in the left turn lane of Fondren. There are lots of left turn lanes and all of them are trashy, but I figured I could at least clean up one of them. Who knows maybe others will join. The job wasn't hard, but man did I underestimate the amount of trash!!! I had to go back home to get a full size trash can and bags. I filled up three large trash bags. 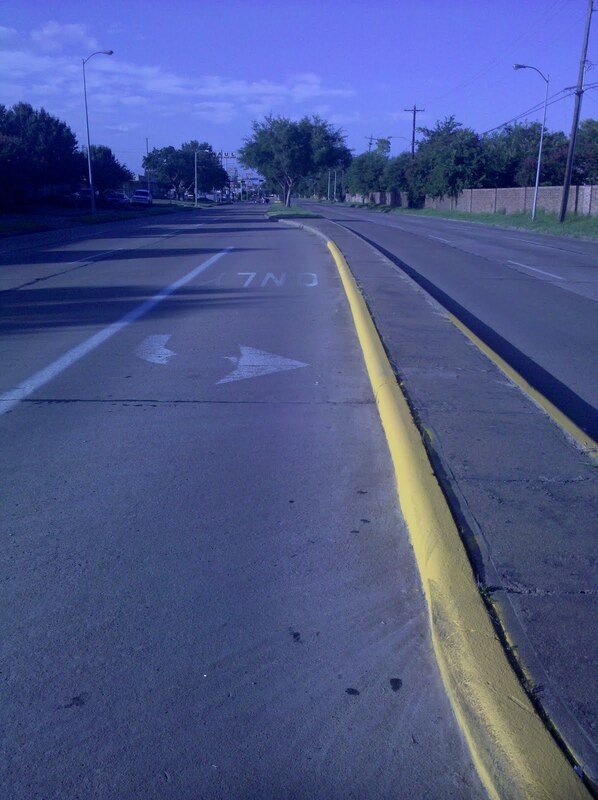 But, now at least the left turn lane at Fondren and Moonmist is no longer strewn with trash. It felt good. I hope others will join in and soon we will have a beautiful street. 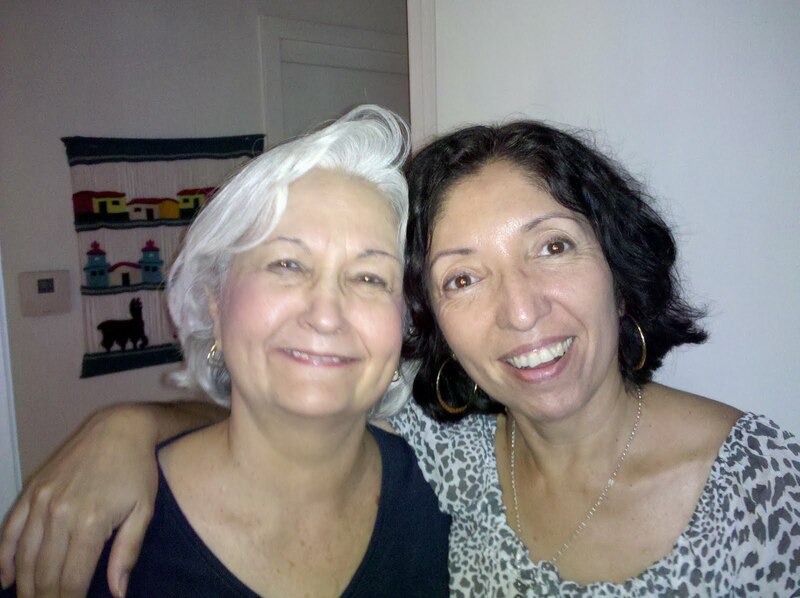 PS: My wonderful wife is trying to help inspire people to help. She created a handbill to encourage our neighbors to help. This evening she distributed it to 49 homes in the neighborhood. Maybe something will come of this. This is a picture of my Fathers Day gift from my lovely daughter. It is an insulated glass with a motorcycle on one side and my name on the other. If you notice, it comes with a top where I can put a straw. It is a very lovely cup, but . 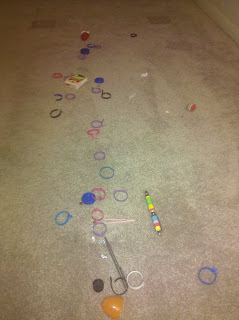 . . Is my daughter trying to tell me something? 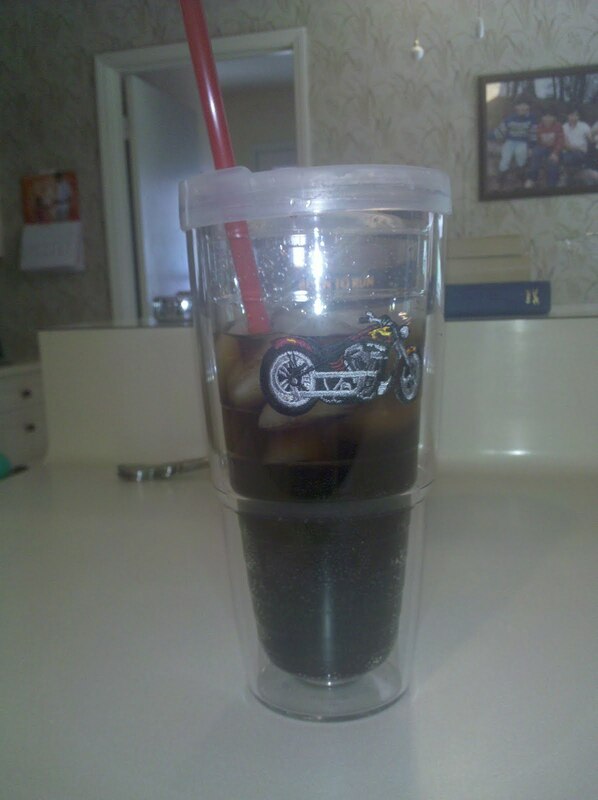 Is that why she gave me a "sippy cup" for Fathers Day? I'm not old yet. :) I'm really not. Love you Anisha and thanks for the lovely gift. It has already saved the day. 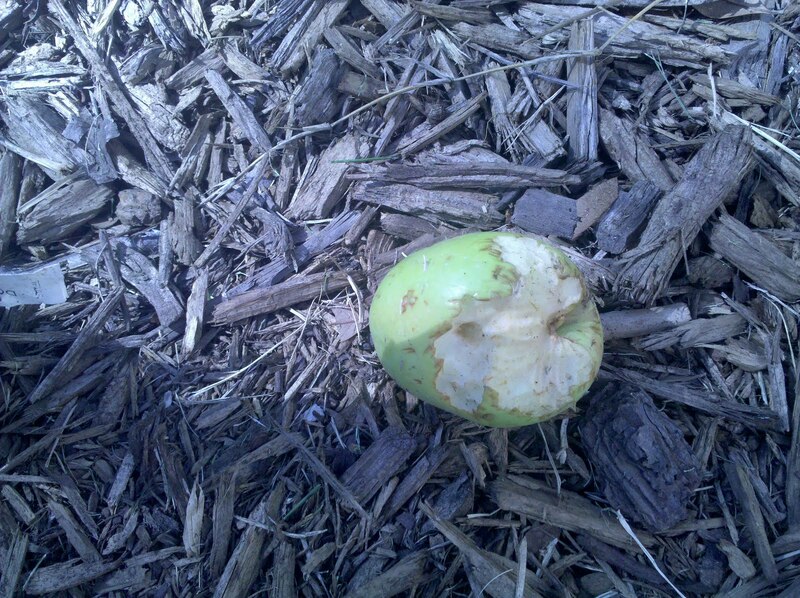 Some unwelcome varmint is stealing my apples. I've lost three of the nine apples. That dastardly, no good, bushwhacking, varmint is not going to be happy if I catch'em. What's that click you hear . . . could if be a round being chambered? Our cat loves to play with the plastic rings and tops from the milk jugs we buy. When I'm opening a gallon of milk, I often throw the plastic ring to Shim and he goes nuts playing with it. I've always wondered where they go. Today I found out. We moved our couch, to get ready for the US vs England world cup game, and look what we found! 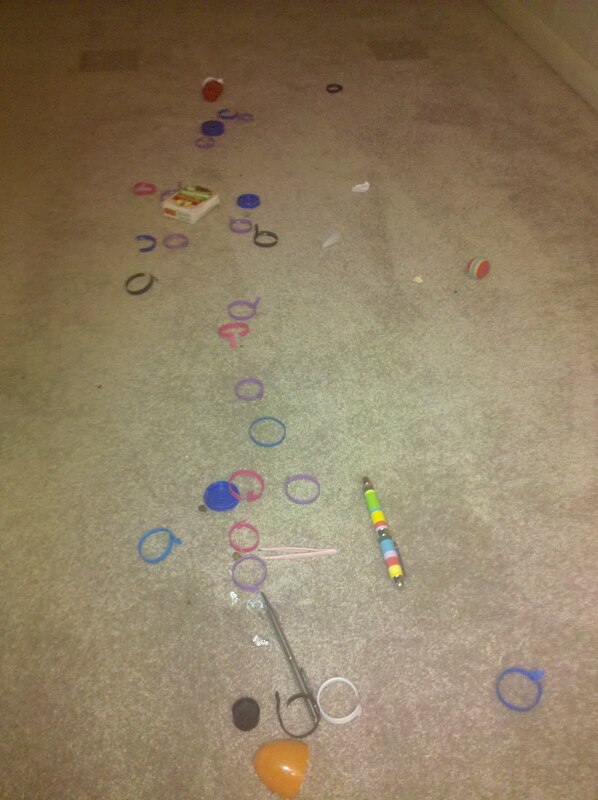 A cat toy treasure trove. 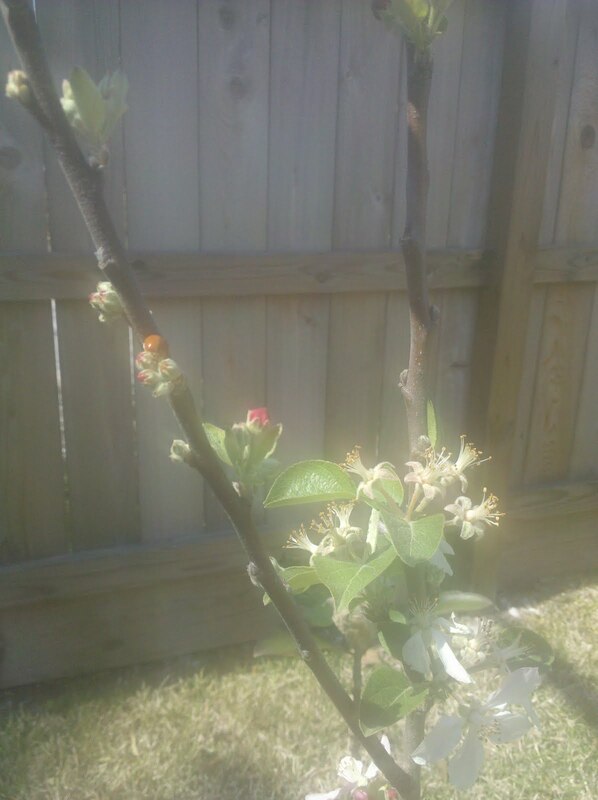 Last winter (2009) I planted two apple trees in my back yard. 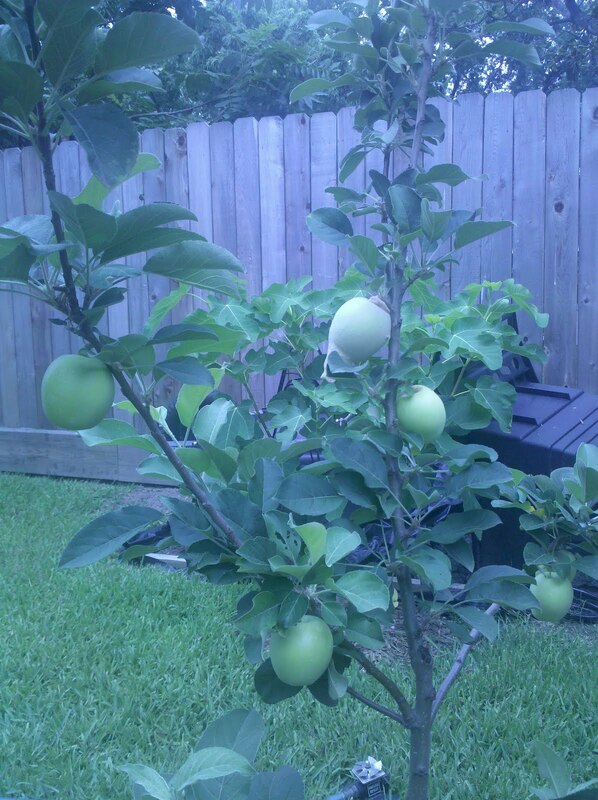 Houston is not know for growing apples, but I thought I'd give it a try. I planted an Anna and a Dorset. 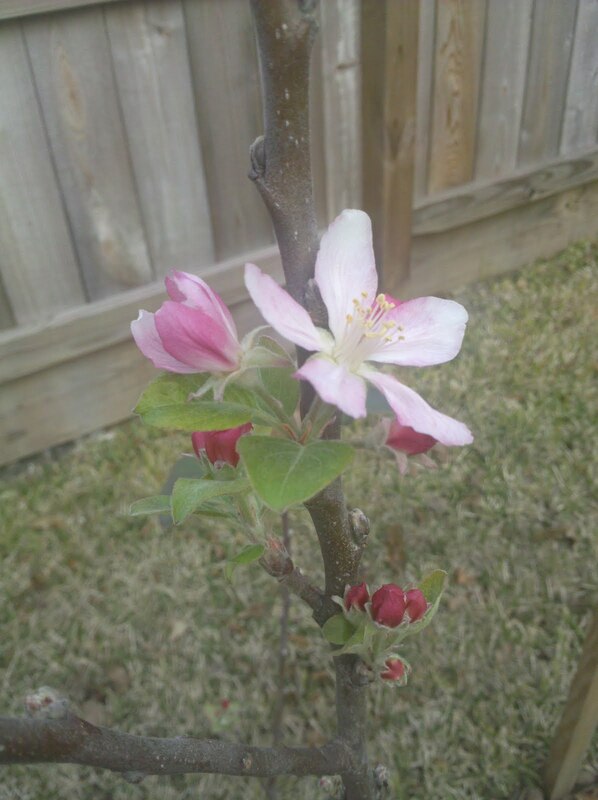 This year they have bloomed and I have apples! Here's a series of pictures of their progress. February 20th, blossoms just start to open. 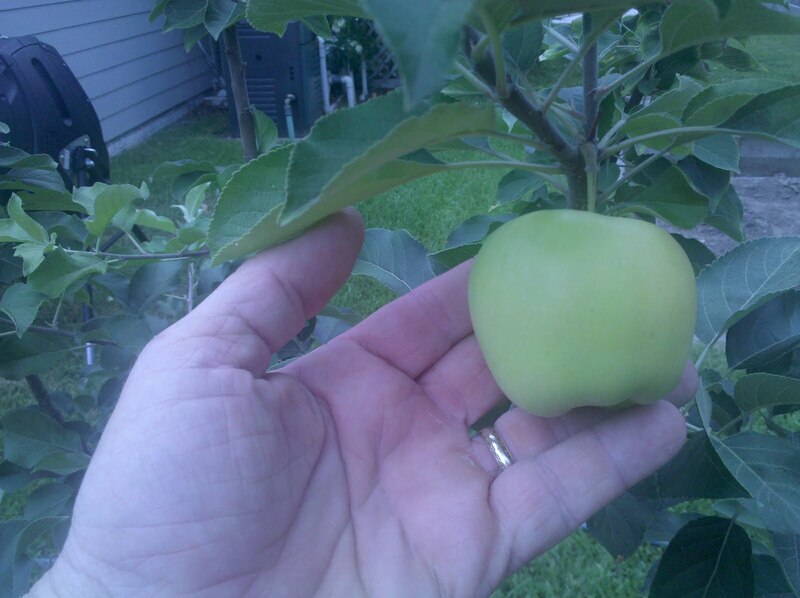 March 25th, apples the size of marbles. 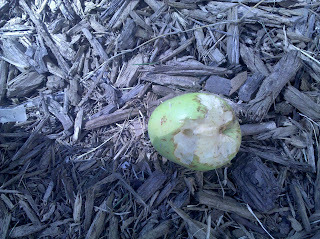 April 20th, they are the size of golf balls. 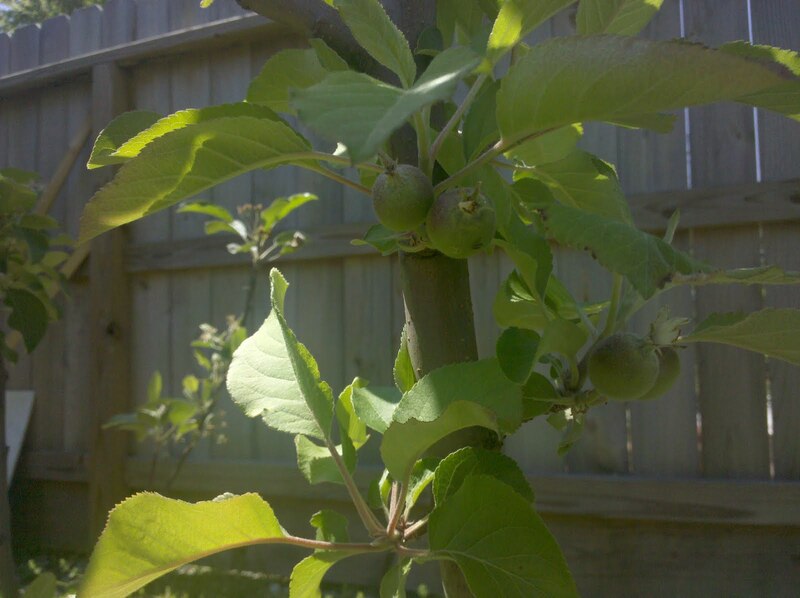 May 10th, don't the just look great! 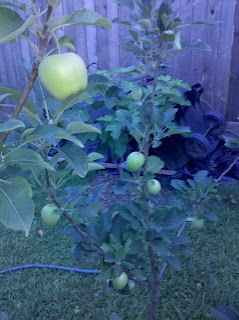 June 2nd, notice the stocking on the center apple. It's my wife's experiment. Now, if I can only keep the birds from discovering them! I'm looking forward to some delicious, fresh, organic apples, SOON. Tomorrow, I'll show you the pictures I took of our black berries. Last Saturday, my wife and I went to get our hair cut. I got my money's worth as Brenda cut her hair much shorter. For the record, I like her hair and so does she. On Monday, we went to see Brenda's mother and father. It turns out that her mother has pretty much the same hair cut. As you can see from the picture below, I think I'll take to calling them "Salt and Pepper". Guess which one is pepper.